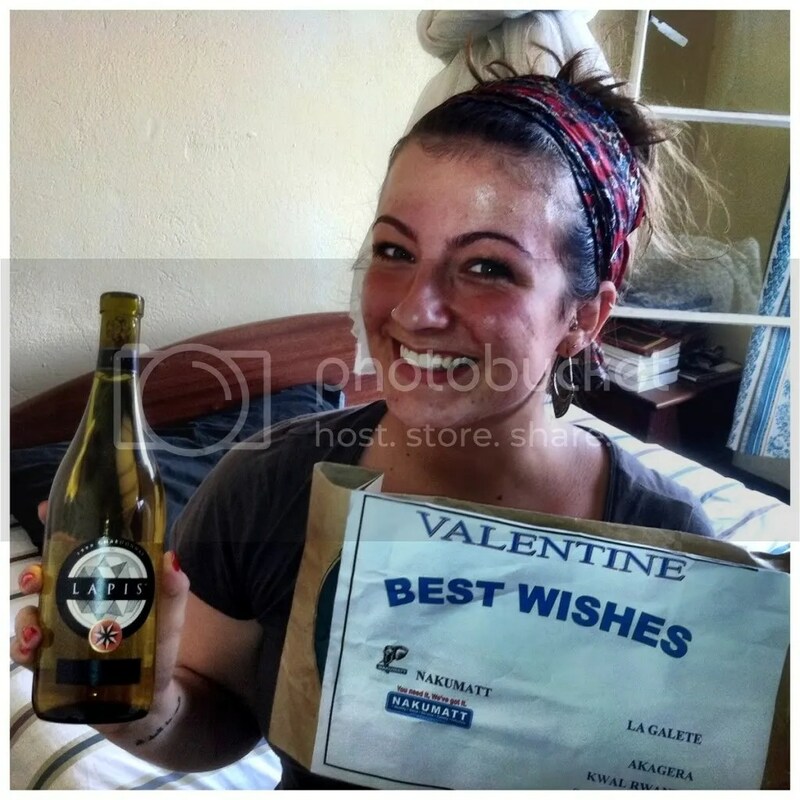 M: Two weeks ago, on our first visit to Kigali, we picked up a few things in the local supermarket, Nakumatt. I think it was just conditioner and lotion. While I was fumbling with my francs, the lady rang up my purchases and printed out my receipt. The bagging gentleman held it out to me and said “Come with me. You have won a gift” in a deadpan monotone. “A gift?” I said. I was sure he was joking. So I was hustled over to the customer service desk where they solemnly handwrote my name and information down in a book and then presented me with a package: A brown paper bag with a sign on it that said “A Valentines Gift for you” (and inside, I found out later, was a gift-wrapped bottle of vintage 1999 Chardonnay from British Columbia. I will let you know how it tastes when I’ve opened it). They made me stand with a tall male employee and get my picture taken while he pantomimed handing me the parcel. I was mortified. Justin wanted to take a picture with his iPhone but I bolted out of the store, shushing him. “But why do you refuse him?” the kind female customer service rep called after me, as I slunk away with my tail between my legs. Hooboy– it was a crazy induction into city life, let me tell you. J: So she somewhat reluctantly let me snap this one when we got back to Deke’s room. I’m pretty sure it was because she didn’t let me take one in the store…but she was a bit flustered and surprised and I shouldn’t have asked…anyways, here’s that pic I was telling you about. M: I should have just let him take the freaking picture in the store. I felt so bad afterwards! Justin loves to take pictures and I give him such grief for it, but if he didn’t make me stop to take a picture now and then, we wouldn’t have any. J: P.S. That bottle of wine is from British Columbia (B.C. for you cultured folks) and the year of Prince’s party, 1999. M: I already told them, babe. Not the Prince part, though, so you get props for that. M: See? This is why I give you grief for taking pictures!! Because we have a million like this. But they are beautiful and you have a good eye for them and we can make an Instagram collage out of them when we return to civilization. J: OOH! Hipster points for referencing Instagram my love! M: AND I’m wearing a grandma skirt and a grandma hairstyle today. Triple Hipster points. M: I make no grumblings about these neat Panoramic pictures J takes with his Hipster application on his Hipster iPad. They are so neat!!! This is the football pitch where he plays with the village young boys– he’s the lone white man out of about 60 Rwandans. And he literally blends right in– I walked past yesterday and it took me a good two minutes to find him! J: Yes, thank you Brent Spead for the Hipster app and Daniel for the Pad. And yes, this is the football pitch. To the far right, there is a lot of grass where the ball gets stuck and you have to kick it really freaking hard in order to get it to go anywhere…although yesterday I tried and it didn’t go anywhere. I was actually laughing at myself. M: Is that where you kicked the stone? J: No, that’s somewhere slightly left of the middle of the picture. And I didn’t kick it. I tripped over it. And again found myself laughing at…myself. M: See? This is why I don’t play football. Or any sport for that matter. I’d rather make the other villages and myself laugh at myself by sliding down a 6 in. hill and landing on my knee in a perfect Icecapades position. While wearing my fancy, no-slip sandals and holding two large backpacks. J: I have absolutely no idea what a “Icecapades position” is, but it sounds fun! M: I just kneeled really gracefully with both of my arms out at my sides, okay? As if they didn’t have enough to stare at me for. J: I’m sure the judges gave it a 10. M: Do you want to write on this one first? J: Sure, this is my plate from dinner the other night. (Notice, there are no lack lack berries?) For now, I’ll simply say that we got 5 very large avocados at the market the other day (think twice as big as they make them in the U.S., yes, even Texas) for about 50 Rwandan Francs. 600 Francs equals a dollar. You do the math. M: I knew you were going to type “You do the math.” I think this is my plate, though, because you don’t eat avocado! J: Nope, I did eat one. J: It was actually pretty good. The avocados here are so fresh they almost have a sweet taste to them…wouldn’t you say? M: Yes, I want to bathe in them. They’re amazing! So light and almost fruity. The perfect accompaniment to spicy beans, rice, and tomato (pronounced to-MAH-to) sauce. J: Ugh! Bathe in them? SMH. M: Never again. Never again use that acronym in my presence. M: We’ve had Freedom Fries, Freedom Toast, and Freedom Ketchup. J: Let’s just say that Freedom has been busy on this side of the pond. M: This is basically what we eat for lunch and dinner. Every day. Luckily it is yummy and filling and sometimes they put less twigs in it than usual. Sort of kidding. J: Oh, don’t be so negative. M: You’re right. Other people cook for us three times a day and I’ve only gotten a branch in my greens twice. Isn’t it hilarious that, in a restaurant in the U.S., we would immediately send that dish back and ask for a refund plus free dessert or drinks? Here, I just removed the fibrous stalk from my mouth, calmly set it on the plate, and kept eating. Puts things in perspective. 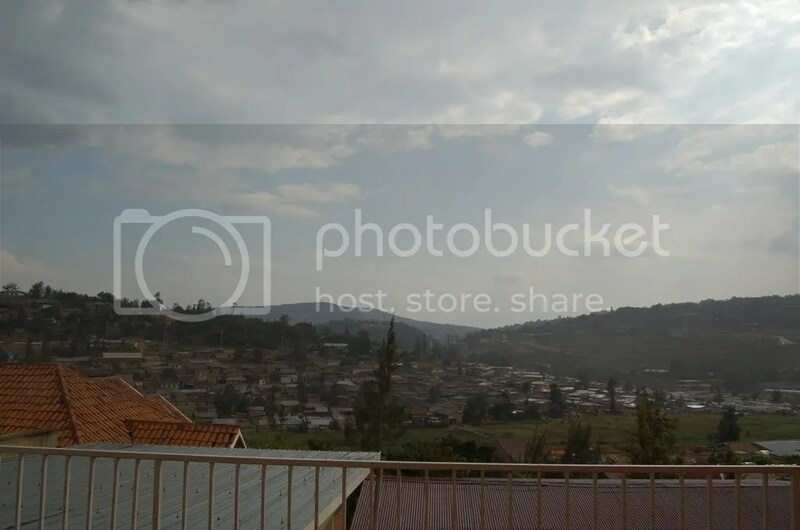 J: This is a picture of the capital city, Kigali. Just so some of you know that there are “proper” cities on this continent. M: We had delicious Indian food for Valentines lunch (including a paper dosa and biryani! Yay!) and I found a yoga mat at a Chinese store called T2000 AND I took a yoga class with a bunch of expats at the U.S. Embassy. Which looked laughably (or maybe not so laughably) like Fort Knox. J: She absolutely loved the yoga class! Many thanks to our friend Jocelyn (see below) for hooking that up! M: We’re going to try to go to Kigali every week to do some work with Deke (since he graduated from the same program as Justin) and to get our expat food, people, outings, etc. fix. We’ve deemed it necessary for our sanity, you know? Just to get away and be with familiar people and things and activities for a few days a week. It is a welcome break and relatively easy to do. Though those busses are going to have to grow on me. J: This is Deke. He’s slicing tomatoes or onions for our homemade salsa! 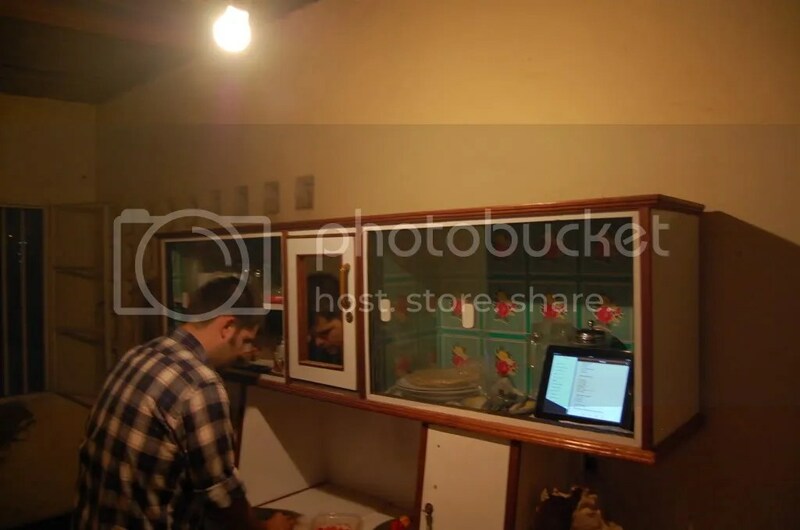 Notice the iPad to the left, Deke keeps recipes on there for when he’s cooking! Pretty sweet eh? M: So glad we bought ours. It is such a precious luxury– so portable and useful. M: While Jocelyn and I were at yoga, Justin and Deke cooked us V-Day dinner– guacamole, real tortilla chips, homemade salsa, and fajitas made out of filet mignon pieces and peppers and onions. In Rwanda, and much of the rest of Africa, tender meat is not valued– they prefer tougher meat. So Deke picked up our filet at Nakumatt for $5. Drool. 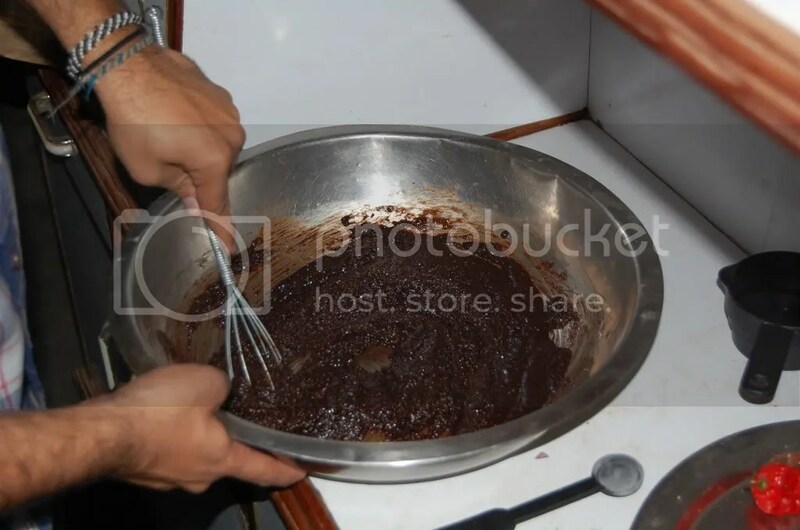 J: Also, while Maggs was in the shower, Deke and I decided to make a chocolate cake to surprise her with! M: That was for me?!?!? J: Yeah, you were the last one to know about it (we tried to hide it from both of them, but Jocelyn came in and discovered it) and we wanted it to make you happy since you had been having a rough couple of days, there. M: You are the sweetest thing! And smart to know one of my weaknesses. Which is, of course, chocolate. This cake was to die for. I don’t know if it was on purpose but it was just a hint salty so it was sweet and decadent and crunchy and then the salt hit you and it was just a party of deliciousness in your mouth. J: Eso es lo que dijo ella. M: Here it is, in all its glory. When they took it out of the oven, the boys threw it in the refrigerator. And that made it collapse. 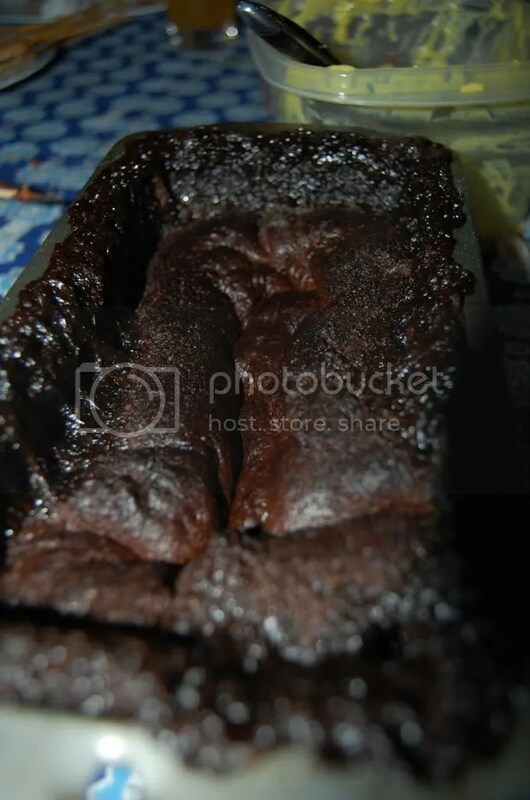 I’m not sure why, but at the time, it made Jocelyn and I crack up to imagine them pulling the hot, delicious cake out of the oven only to think it was a good idea to put it in the fridge. That may have been the passionfruit mimosa talking, but I swear it was the best joke I had heard all day. That crunchy top was just divine! J: It sounded like a good idea to us at the time. And I think we might have simply thought that it would be a good way to keep it hidden from Maggs…I dunno. M: You are so sweet. And wickedly funny– sometimes without meaning to be. Regardless, it was delicious. 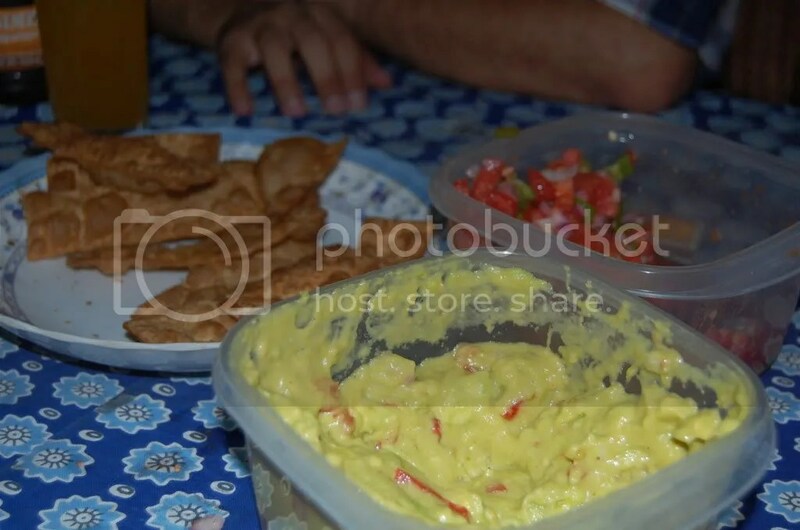 J: Here’s the homemade salsa, guacamole, and chips. Deke sliced tortillas for the chips and then I put them in oil to harden them. They were super delicious, as was the guac and salsa. M: It was just superb. Seriously. 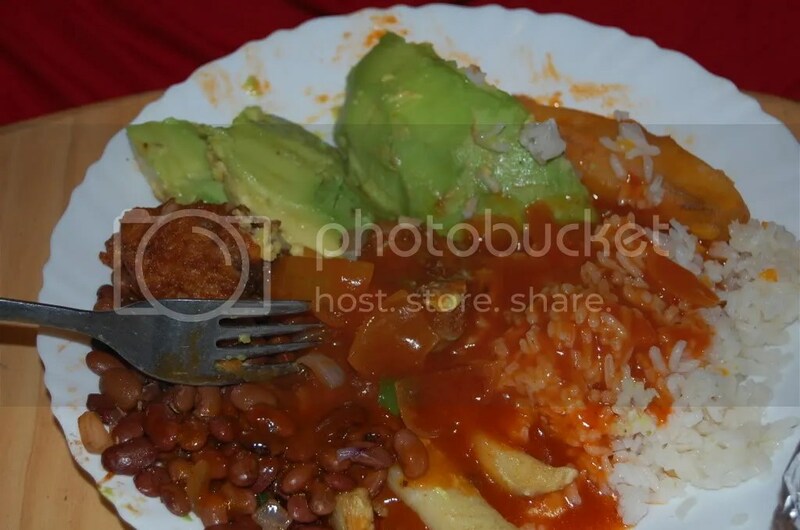 This meal blew me away– and not just because I had eaten rice and beans for the past 983479283 days. It was so simple and flavorful and good. A simple meal, but it made me so happy! 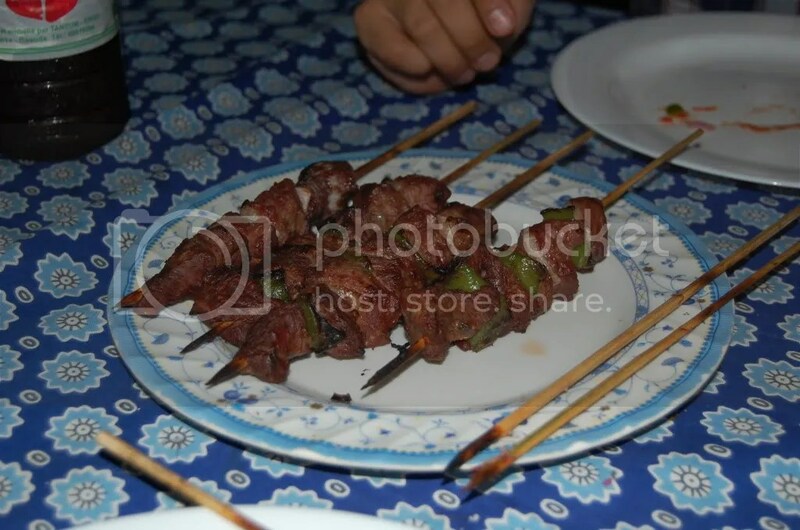 M: I know I complain a lot about our situation here, but I am truly thankful for how it is revealing to me what I have, what I take for granted– especially back in the U.S. After eating goat kebabs that made my teeth ache the other day, this meat made me groan with pleasure. Literally. I could slice through the tender pieces with my teeth alone! It was like butter. I hope that sort of appreciation will sink deep down and take root in me so I am always thankful for tender, flavorful, simple food. J: Mmmm…just looking at this picture gets me excited for next week; we’re planning on having dinner with them every Tuesday! M: I guess we should go order our beans and rice for dinner now, huh? J: ::looks at the time on his phone:: Yes, we’ll be back…enjoy…you’ll never know we left. J: So much for uneventful! M: I know you can’t tell, but that took way longer than it usually does. First, because we had to interrupt a dance party in the kitchen, and second, because a large thorny branch attacked me in the dark when we were walking back to our room. By attacked, I mean I tripped over it and then it lodged itself in my legs and skirt. Justin, my knight in shining armor, pulled every piece out and even got a war wound: a thorn prick on his finger. Hilarity ensued. J: We might not like it very much over here, but boy does Rwanda keep making it, at the very least, interesting and new each day. M: Anywho, we’re back. These are our Valentines Dates. Deke apparently has a habit of doing this in pictures, so don’t hold it against him. 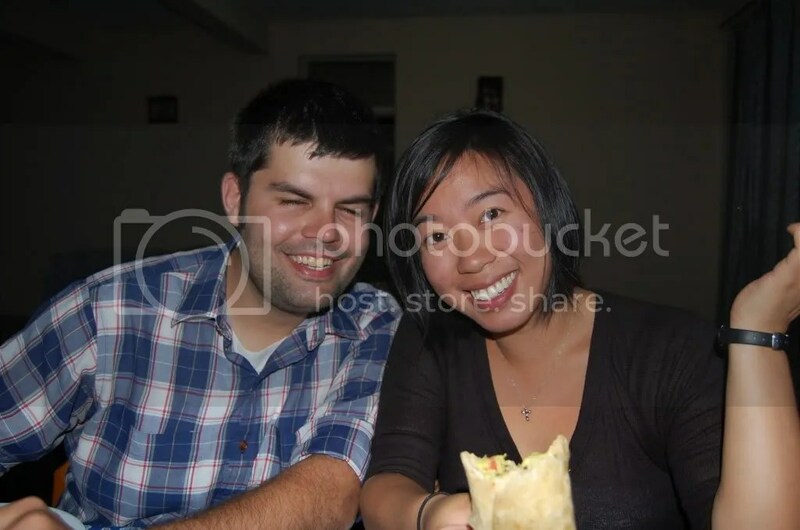 J: Notice the chapati in Jocelyn’s hand, it’s filled with that delicious filet you saw. Soo good. M: We were talking here about going to see the gorillas in North Rwanda, I think. Then Jocelyn and Justin started talking about the hippos they’ve seen and how I won’t go swimming in Lake Muhazi (the lake right outside our doorstep) because someone at Deke’s work said there used to be hippos there. J: This is Jocelyn’s impression of a baby hippo. And I’ll let you know how swimming in the lake is after tomorrow morning–I’m gonna wake up to work out and play basketball with the Bishop’s son, Sam, and his friends, tomorrow at 6 am. J: Ugh, just read the above statement again! Who am I? 6 a.m.? M: This is just a place for abnormalities for us, kiddo. Get used to it. I will be sleeping in and then watching “Ever After” so I’ll see you when you get back, my lovingest love. J: Not so fast, we’ve still got a few more pictures and I haven’t eaten yet. 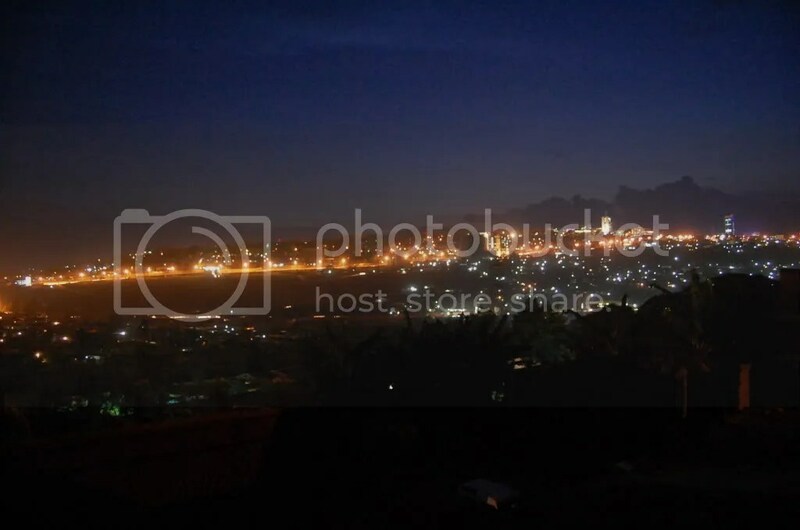 J: I took this to show you Kigali at night. There it is. M: What a talented husband I’ve got! Ugh, your breath smells like a Jolly Rancher. J: They HATE Sherlock Holmes here!!! M: As mentioned previously, J likes to take artsy pictures of windows and doors. 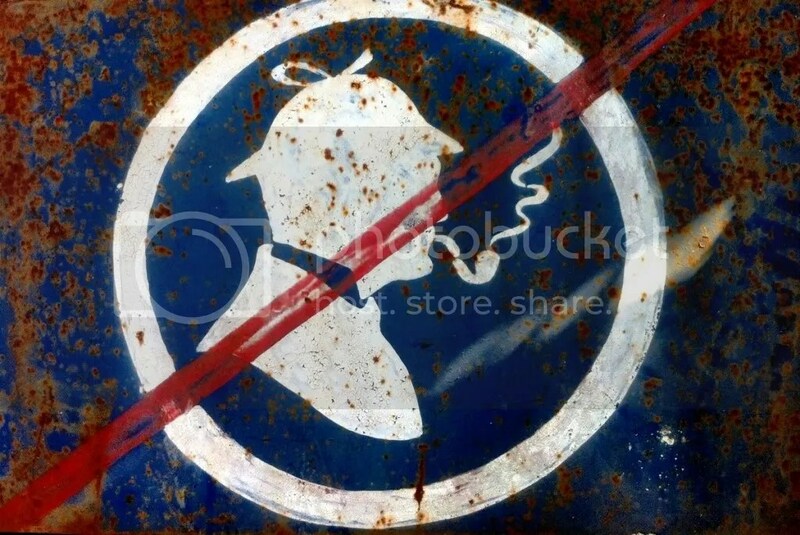 Another thing he has an affinity for is signs– like this one that forbids detectives or smoking or something, rusting away in the hall on the side of the Guest House where we live. It may or may not find its way into our bags when we depart. J: Nothing to say about possible theft, I plead the fifth (does that work here?). And the best part about this sign is that it’s leaning again a fence pretty much in the middle of nowhere on the compound. It’s definitely in the least traveled area on the premises. M: So they won’t miss it if it’s gone. No seriously, I’ll ask Alfred if we can have it when we leave. Don’t worry. I’ll take care of it. J: Whoa! Just noticed that the bottom of the picture didn’t load! 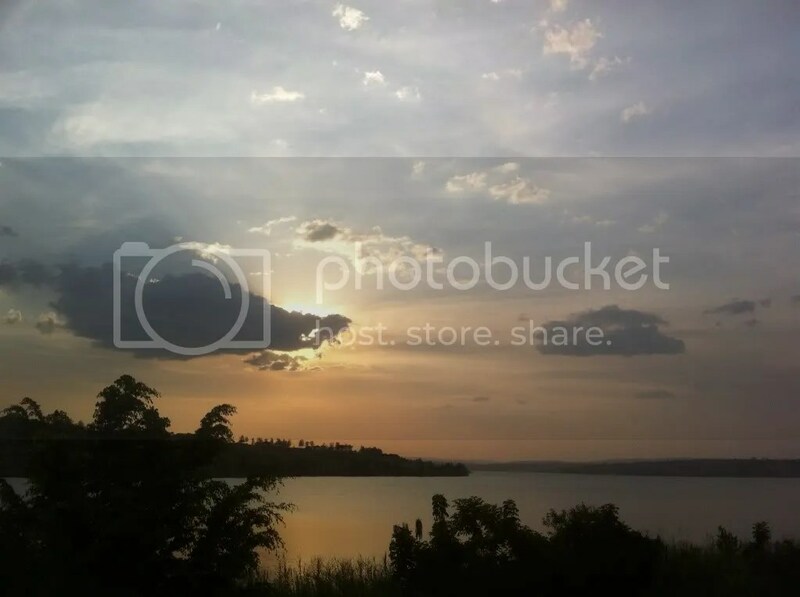 Freakin goofy internet…it took me about 3 hours to load these damn pictures onto photobucket this afternoon. Thankfully I had some Angry Birds and Plants beating up on Zombies to keep me company while I waited and Maggie read/took a siesta. M: I dreamed I was still reading my book. While it was on my face and I was actually sleeping. M: Thank you for eavesdropping. Everyone has had such nice things to say about our ramblings; we really appreciate it. We are doing this to keep ourselves sane and like that it maintains a connection with our lives back home. M: I would actually like to get famous. J: On second thought, make my potatoes a salad. M: Bless you for coming out in public. ← Theological Reflection 2: Eve was the first human. oh my word, i love you two so much. reading this will probably the most amusing moment of my entire day. Um, I’ve been turned into a cow, can I go home? You gotta get down with the Linsanity! 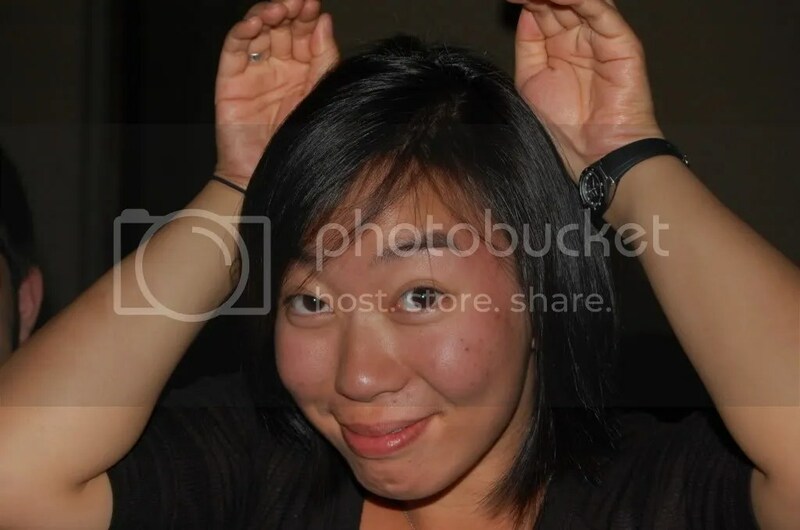 All this blog does is Lin!